Southland, New Zealand, 2017-Aug-12 — /Travel PR News/ — Real Journeys lavish sold-out Birds of a Feather Conservation Ball has raised over $100,000 to help bring back the birds to the Wakatipu. Held on Saturday and run in partnership with the Department of Conservation (DOC), Real Journeys foots the bill for the evening with the money raised donated to the local conservation movement. The Wakatipu Wildlife Trust (WWT) and Routeburn Dart Wildlife Trust (RDWT) will share most of the proceeds – both receive over $30,000 each which will go towards predator control in the area. The funds enable RDWT to embark on a new trapping project on the Dart and Rees rivers which are part of a rare ecosystem and home to five bird species that are listed as nationally vulnerable, endangered or critical. The Wakatipu Wildlife Trust says its share will further efforts to fill the gaps by supporting existing and new predator control groups across the Wakatipu basin. 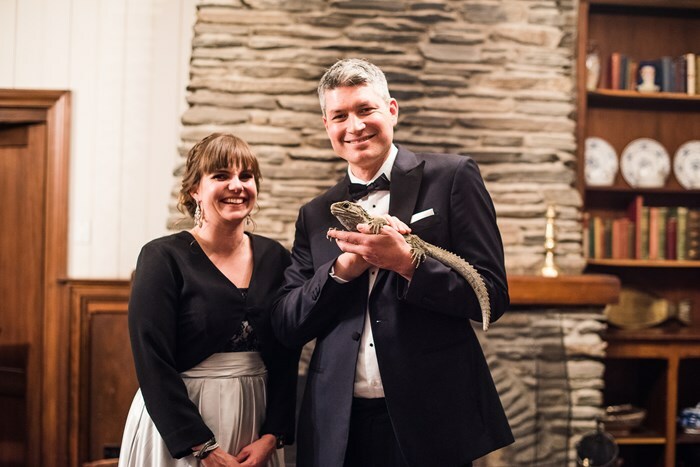 As well as $62,940 raised from the tickets and prizes auctioned on the night – a hundred Goodnature self-resetting traps were sold at the ball which Goodnature is matching with a further hundred traps. These 200 traps, worth almost $40,000, are enough to control rats for 100–200 hectares or stoats for 2000 hectares. DOC’s Director-General, Lou Sanson attended the event for the third year in a row and declared it the “best yet”. Four surprise guests put in an appearance – two tuatara and two kãrearea (NZ falcons). “It was great to see the surprise and delight of our guests when these very rare New Zealand creatures came into the room,” says Real Journeys Chief Executive Richard Lauder. Well known television and radio personality Jesse Mulligan and DOC’s threatened species ambassador Nicola Toki were the MC’s for the evening. Jesse said Real Journeys had shown that conservation is no longer a fringe issue of interest to hippies and vegans. “It was heart-warming and inspiring to see some of Queenstown’s (and New Zealand’s) most successful people donating their time and money to restoring Wakatipu to its former environmental glory. I was honoured to be involved and to learn more about the work many fantastic individuals and organisations are doing in this beautiful region,” says Jesse. A number of companies and artists donated the auction prizes which raised $29,755 of the total raised on the evening. Items included a Weta Workshop Experience (including two nights at Wellington’s Grand Mercure Hotel), Aro Hã Wellness Retreat, the Hollyford Track Guided Wilderness Experience and a John Crump oil painting. Other companies also assisted by supplying wine and flowers. “We really appreciated the way other companies approached us and came to the party to help us and DOC with this vital conservation effort and make the night the success it was,” says Richard. Executive chef Mauro Battaglia had created a special four-course menu for the 130 guests. Highlights included West Coast Crayfish canapés, Stewart Island salmon confit with mandarin paste, coffee cured venison carpaccio with salted baked pear and hazelnut and Cardrona merino lamb shoulder with white onion and anchovies puree, followed by dark chocolate moelleux. The evening concluded with dancing to Queenstown band LA Social and a midnight cruise on the steamship TSS Earnslaw. This entry was posted in Business, Festivals and Events, Travel, Travel & Environment, Travel Management, Travelers and tagged birds, Birds of a Feather Conservation Ball, Jesse Mulligan, Lou Sanson, Mauro Battaglia, Nicola Toki, Real Journeys, Wakatipu. Bookmark the permalink.